This article was written on 11 Oct 2017, and is filled under Events, Monsoon Asemblages. 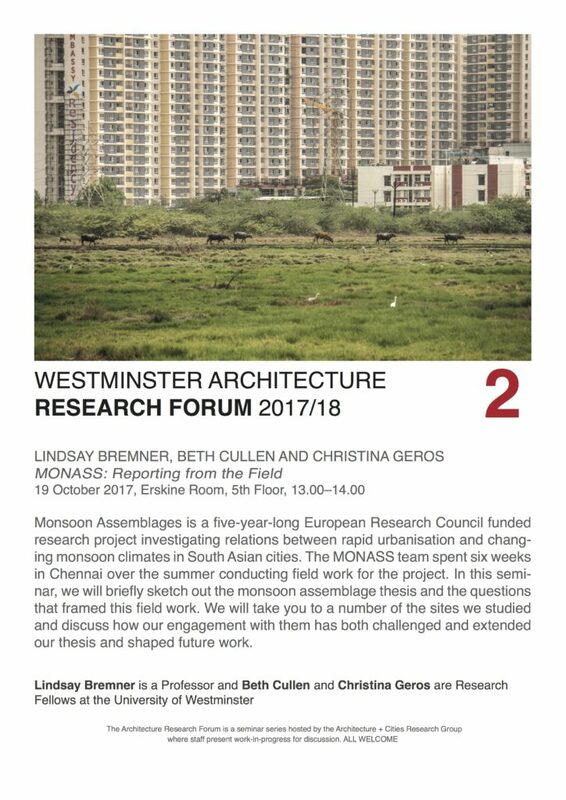 Monsoon Assemblages is a five-year-long European Research Council funded research project investigating relations between rapid urbanisation and changing monsoon climates in South Asian cities. The MONASS team spent six weeks in Chennai over the summer conducting field work for the project. In this seminar, we will briefly sketch out the monsoon assemblage thesis and the questions that framed this field work. We will take you to a number of the sites we studied and discuss how our engagement with them has both challenged and extended our thesis and shaped future work.